Is Tallahassee Bracing For A New Housing Market Bottom? 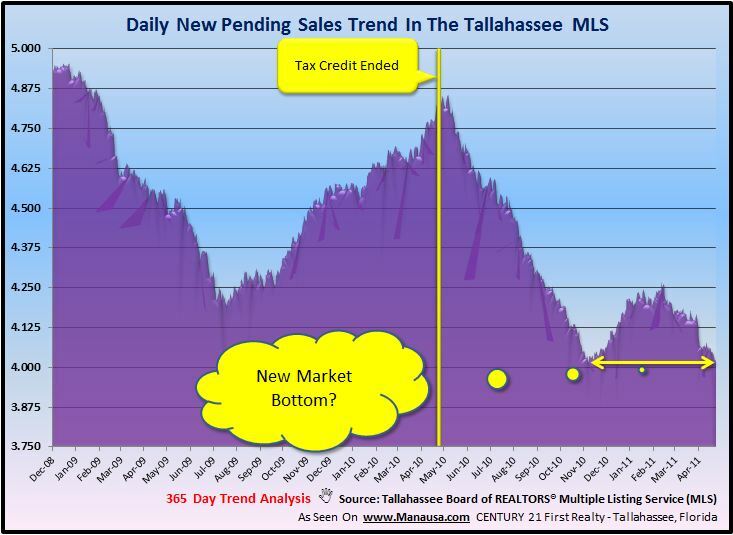 Updated reports compiled from the MLS in Tallahassee show that the Tallahassee housing market might be bracing for a new market bottom. Pending home sales appear to be settling down to the lowest level since we began daily measurements in 2007, and closed home sales appear to be following a similar track. In the real estate graph below, the one-year trend of daily pending home sales (new contracts) has reached the previous market bottom level established on November 13, 2010. With the anniversary of the end of the Homebuyer Tax Credit just a few days behind us, we can only hope that the trend will now turn higher. 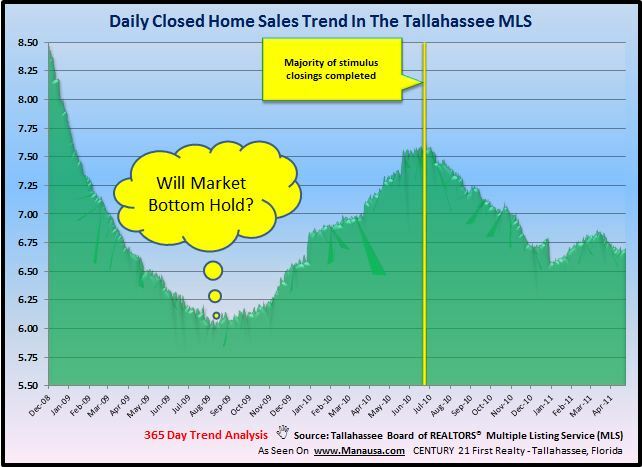 Closed home sales in Tallahassee appear to be following a similar track, though we are still experiencing more closed homes than we were at the previous market bottom recorded in August of 2009. Currently, we are still trending about 220 home sales per year stronger than we were at the market bottom, but the low number of pending home sales make it appear as if our current trend will be falling. 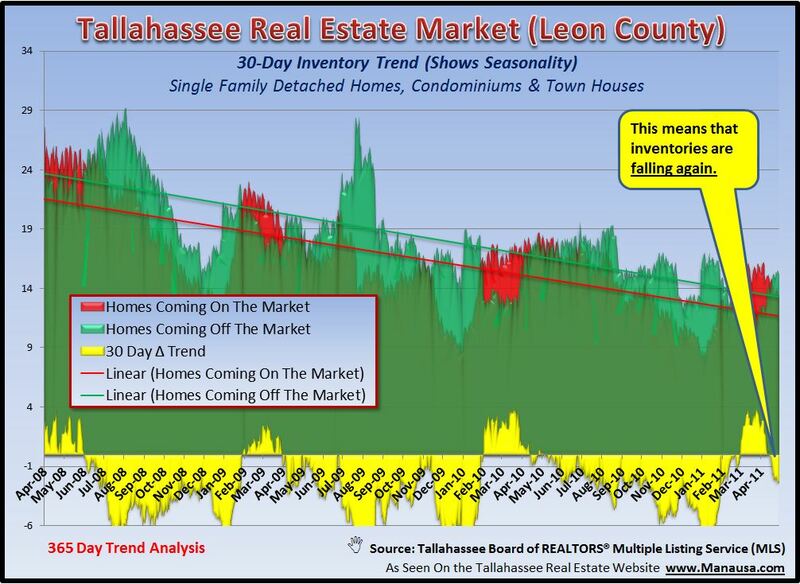 When we look at the supply of homes for sale in Tallahassee, we see that new inventory is coming onto the market at a very similar pace as inventory leaving the market. Unfortunately, inventory leaving the market includes homes that failed to sell (along with homes that successfully sold). This means that we are only seeing the growth of the shadow inventory as many unsuccessful sellers are choosing to not reenter the market at the present time. We know they will be ready to jump back in when the housing market shows any real signs of improvement. The key for seeing improvement in the housing market lies in the resumption of the low equity requirement loans that we saw prior to the boom of the housing market. This is not a call for the reckless loan programs that caused the crash, rather it is an acknowledgment that the responsible low-equity loans of the 1990s are the needed cure for homebuyers who enter the market having sold a home that left them with no equity.